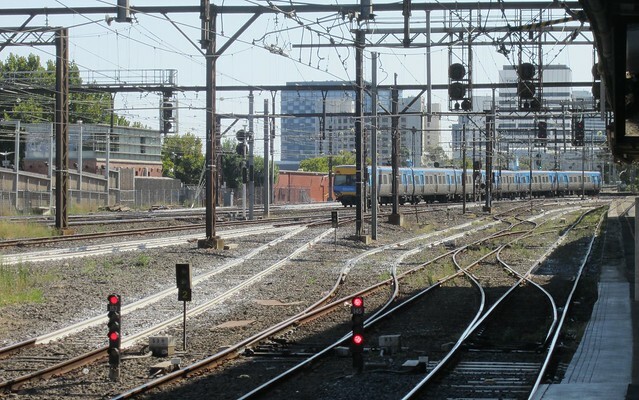 Near Flinders Street Station, some tracks have been painted white. Looks odd, doesn’t it. Apparently it’s to reduce heat, and thus reduce the possibility of track buckling and other problems. So does that count as infrastructure that comes under the responsiblity of Vic Govt or is it Metro that would have painted the tracks? I’m just wondering how much better Connex would have met it’s KPIs in 2009 if tracks had been painted white in key areas……. I thought they were for the driver to see if the track is buckled, trying to stop a derailment. I can only laugh, with a sad face. Do they paint the tracks white in Saudi Arabia, India, etc where it gets over 40C day after day in summer? No? Oh thats right, they have Fishplates with gaps to allow for expansion in the heat. Yeah, it does look odd. Perhaps more alarming is all that brown long grass growing around the tracks. A bit of a fire risk. Whose responsibility is it to clear the grass?? If they want them painted white on a large scale, all they need to do is distribute cans of white paint to the young hoods at every station and tell them to go nuts, but try to get most of it on the actual rails. As the Solacoat link suggests, this has potential to reduce heat-related delays, so I’ll be interested to hear what they find (since it seems to be a trial). This has major relevance to Melbourne, since heatwaves will be a major and growing problem if we keep putting as much carbon dioxide into the atmosphere as we do now. I think they should concentrate their efforts on replacing all the rotted sleepers than painting the rails. Until they do more derailments are inevitable. When I was in Portland, OR recently a girl living in the house I was staying in had this wonderful contraption that attached to the back wheel of her bike and laid down a chalk trail as we rode around the city. I wonder whether it would be feasible to set up a similar system that automatically spray painted the tracks as trains rode the rails. Due to drying issues you’d probably only want to do it on the last service at night but it could save on labour costs if the system was easy and cheap enough to implement. Or as Jacob suggested, a real solution could be used! 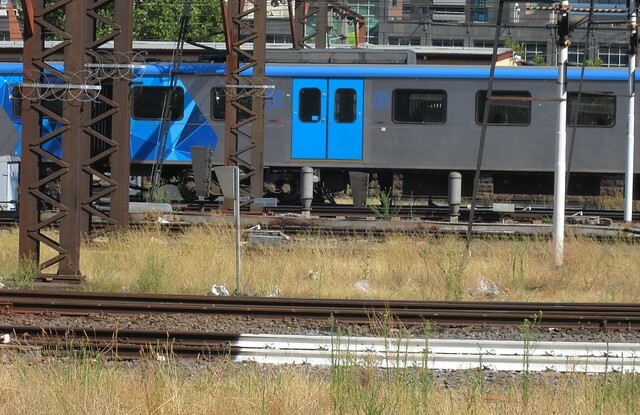 What happened with the concrete sleeper replacement on Glen Waverley line? There are still many sleepers that are wooden and rotten, and they have left piles of concrete sleepers on the side of the track for many months now. Are they going to wait till school starts before completing the job and annoying everyone? I agree with Roger, the grasses on the sides of tracks and other rail owned land is very high and dry at this time of year. Perhaps Metro is waiting for a fire to rip through and save them the cutting job?? I have complained to them many times and received no meaningful response.